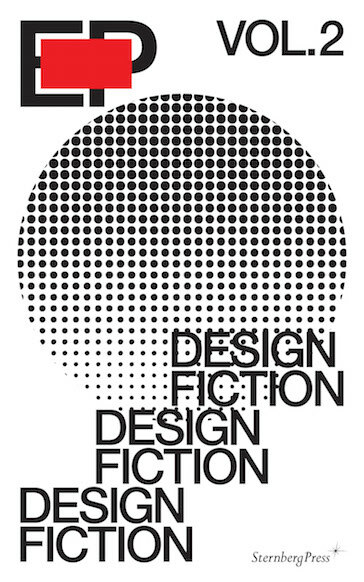 For many designers the term “design fiction” is very much linked to the work of Anthony Dunne and Fiona Raby (as well as Bruce Sterling, Paola Antonelli and Lucas Maassen). When thinking of Dunne and Raby’s work, one thinks of design fiction – and the other way around. Since the second volume of EP, a book series edited by Alex Coles, is on design fiction it had to (so it seems) include their work. But as there are also many other designers, artists and writers working in this field, it is worth to have a closer look at these diverse practices. And fortunately the publication is also offering this wider perspective. Next to interviews, artist projects, and essays the volume also includes one of the final interviews to be published with novelist and semiotician Umberto Eco; a conversation with Bruce Sterling, in which the science-fiction author responds to designers who reference his writings; and design theorist Vilém Flusser’s 1966 essay “On Fiction,” in its first English translation. The makers of the book series EP, which refers to the “extended play” format introduced in the late 1950s in recorded music, aim to “create a new platform that is yet saturated within the publishing sphere by moving between academic writing and popular magazines” and combining perspectives from art, design and architecture. Then there is also the writer Umberto Eco, mainly known for his book “In the Name of the Rose”, but who was also a philosopher, semiotician – and someone highly interested in correspondence between image and text. For him, image and text were interwoven and in order to develop his stories, Eco used to design and draw the spaces in which they took place. “With ‘The Island of the Day Before’ (1994) I spent one year designing every detail of the interior of the ship the story unfolds on”, he said in his conversation with Alex Coles. Now, one can of course debate to what extent art – and also design – can and need to follow this responsibility. But leaving this aside, it becomes clear that the power and potential of this discipline (no matter if called “design fiction” or “parafictional art”) unfolds when it is implemented into reality. By designing fictional objects that are, right from the beginning, solely meant to be in an exhibition one may succeed in raising awareness, but mostly this experience stays in the museum – a space that, for so many visitors, is not linked to their daily life. A much higher impact, so it seems, can be achieved by reaching people in their realities, for example through news channels (by offering visions for a better world) or in their working environment (like through the implementation of design fiction methods in science and research labs) – and by putting the ones who are in power under high pressure. It becomes clear that design fiction is a wide field and that there is still a lot to discuss. But this publication certainly offers a profound research and broad basis to open up a diverse discourse. Contributions by Paola Antonelli, The Atlas Group (1989–2004), Alex Coles, Anthony Dunne, James Dyer, Umberto Eco, Experimental Jetset, Vilém Flusser, Verina Gfader, Huib Haye van der Werf, Will Holder, Sophie Krier, Carrie Lambert-Beatty, Lucas Maassen, Valle Medina, Philippe Morel, Rick Poynor, Fiona Raby, Benjamin Reynolds, Hiroko Shiratori, Bruce Sterling. This entry was posted in Literature and tagged Alex Coles, Anja Neidhardt, Anthony Dunne, Benjamin Reynolds, Bruce Sterling, Carrie Lambert-Beatty, Experimental Jetset, Fiona Raby, Hiroko Shiratori, Huib Haye van der Werf, James Dyer, Lucas Maassen, Paola Antonelli, Philippe Morel, Rick Poynor, Sophie Krier, Sternberg Press, The Atlas Group, Umberto Eco, Valle Medina, Verina Gfader, Vilém Flusser, Will Holder. Bookmark the permalink.